It is possible to find isolated passages in Tertullian’s lengthy attack on Marcion that can be interpreted as if the Church Father is critiquing a text. One must be wary, however, of translation bias and equivocal words, such as “gospel/evangelium”—so frequent in Tertullian’s writing. That word has long since become synonymous with four well known Christian religious texts, and we have quite forgotten its older, more general meaning (“doctrine”)—prevalent when Tertullian was writing and before the canonical gospels had conquered the western world. Another problem is that modern translations of Tertullian’s writings have been carried out under the false conviction that a text of Marcion was indeed the subject of the Church Father’s attack. The translators themselves use words in English like “published”, “interpolation”, “abridgement,” “mutilation”—words that (even unwittingly) reflect something physical, in this case a document. For example, “announced” or “made known” may be more appropriate than “published.” I have not studied the Latin manuscripts of the Church Father and have no plans to do so. Nevertheless—though I hardly suppose it will take place any time soon—what will eventually be necessary is a scholarly re-translation of much of Tertullian’s anti-Marcionite work, with the knowledge that the Church Father was combating a theology, not a text. For over a century, the subfield of marcionite studies has been primarily engaged in reconstructing a text, one that is at odds with Marcion’s own theology. The resulting disconnect between text and theology has apparently been overlooked. But it is fatal. No amount of textual hokus-pokus can overcome this problem. If the reconstructions of Harnack, Knox, and Klinghardt do not reflect Marcion’s known theology, then they must be false. Tertullian’s idea that a textual Gospel of Marcion was a mutilation/abridgement of the Gospel of Luke is equally false. And this idea was not original to Tertullian but has a pedigree. Polycarp (mid-II CE) had already enjoined the Philippians to repudiate those who “mutilate the logia of the Lord” (Polycarp, Phil. 7.2). Irenaeus (late II CE), a Church Father writing only one generation before Tertullian, expanded on this notion of doctrinal “mutilation” and explicitly applied it to Marcion (passage cited below). We now know that no such mutilation occurred—for Marcion’s doctrine came first. Marcion did not “mutilate” the logia (or the “Gospel of Luke”). Rather, the Gospel of Luke expanded (and reacted to) Marcion’s theology. The priority of Marcion’s theology was precisely what the several Church Fathers wished to obscure and deny! We thus see a sophisticated and calculated ‘bending of the evidence,’ accomplished across generations and involving the cooperation of several ecclesiastical leaders in disparate geographic areas. 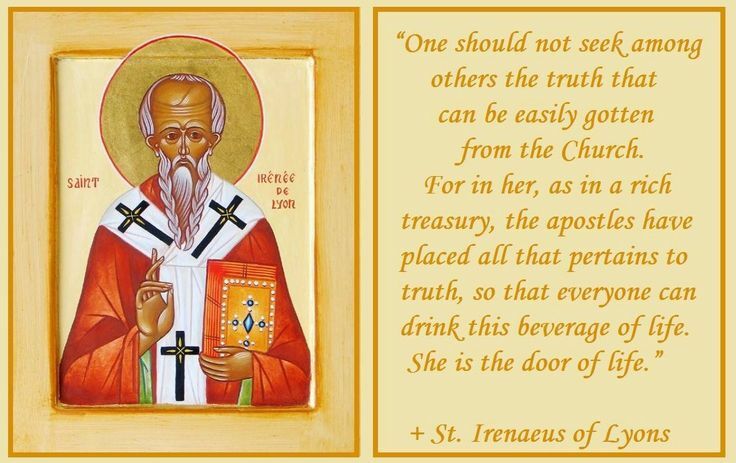 We are reminded of the role Irenaeus played regarding the Hebrew Gospel. It was Irenaeus who apparently first came up with the deceptive idea of renaming the Hebrew Gospel “the gospel of Matthew in Hebrew” (see here)—from which we have inherited the false name “Hebrew Matthew.” In effect, this literary ploy helped erase the very early and docetic Hebrew Gospel from history and substitute the canonical Gospel of Matthew in its stead. The ploy was very successful, as the Christian tradition has consistently maintained that the Hebrew Gospel was simply an early version of the Gospel of Matthew. The last passage above appears to have been written expressly to contradict the Marcionite christology that we have identified as Stage 2 (see below). Indeed, none of the above passages would be remotely expected in a gospel espousing a docetist christology. 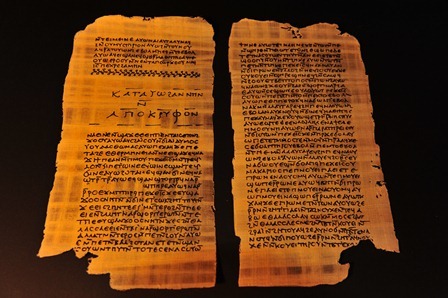 Of all the gospels as text known to us, the most “Marcionite” would probably be the Gospel of Thomas. After all, in that work Jesus is the incorporeal voice of the saving gnosis, the flesh is consistently disparaged, and encratism is a hallmark of the holy life. Though few scholars today would link the Gospel of Thomas with marcionism, to me these appear theologically very close. 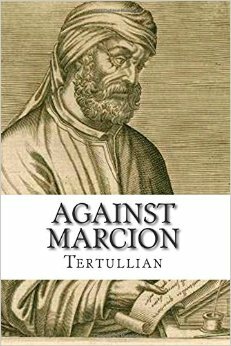 Tertullian is by far the most important writer supplying knowledge of Marcion and his theology. Any verdict that encompasses his Against Marcion must carry the day. With this in mind, we are now able to add Tertullian to the nine Church Fathers before him (the list is here) who fail to supply evidence for a “Gospel of Marcion” as text. Later information on Marcion supplied by Origen (Celsus), Adamantius, and the Muratorian Fragment do not alter this view. We can now place Tertullian’s work in a broader context. Against Marcion is a landmark work in the battle of christologies: Stage 3 against Stage 2. Tertullian is one of the most important (and successful) champions of the new christology centering around Jesus of Nazareth. By defending the flesh of Christ, this Church Father hammered the coffin lid down on the older christology whereby Jesus was purely spiritual, whereby anyone could become “a Jesus,” and whereby the creation, and all things material, were somehow evil. These were Tertullian’s battles, as we also see in some of his other anti-Marcionite titles: “On the Flesh of Christ”, “On the Resurrection of the Flesh”, etc. In this battle of christologies—for and against the flesh—Irenaeus, Tertullian and the other Church Fathers were successful. Marcion’s docetism, and the first century conception of Jesus as a universal indwelling spirit apart from the flesh would soon be forgotten. That earlier theology has been sternly suppressed. To understand Christian origins, however, we must see past ‘Jesus of Nazareth’ and resurrect the earlier view. Eventually, of course, we will have to go back farther still, to Jesus as the redeeming gnosis (Stage 1)—an entirely secular notion that requires no god. In fact, this stage is still apparent in many pithy logia and parables found in the canonical gospels, in the Gospel of Thomas, and in some apocryphal texts. That early and authentic gnostic stage predated even Marcion. It is not the subject of this series of posts, but properly belongs to other investigations. Great series of posts, René. Yes “Against Marcion is a landmark work in the battle of christologies”, but are any of these writings a reflection of what really happened? Have the works attributed to the linchpins Irenaeus and Tertullian also been doctored? I.e. have these literary works been edited and redacted, perhaps several times, over several generations, to leave a trail of back-dated literary works to misrepresent what really happened? 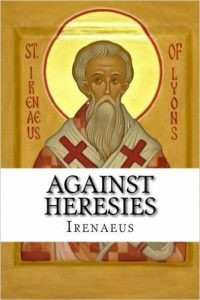 Are Irenaeus & Tertullian’s ‘adversaries’ misrepresentations? i.e. strawmen? There have been a lot of publications on Marcion recently: Jason BeDuhn (2013); Dieter Roth (2015, Roth’s 2009 PhD dissertation was on Marcion); Judith Lieu (2015)… A. Scherbenske (2013)… A. Radde‐Gallwitz had discussed the role divine simplicity played in the debates surrounding Marcion. After reviewing the responses to Marcion offered by Tertullian and Irenaeus of Lyons, he discussed in particular Ptolemaeus Gnosticus who, like the others, sought to avoid attributing contradictory motives to God. This Ptolemy had apparently achieved this by distinguishing between a first God, who is simple and uninvolved with creation, and a second God, who is complex and involved with matter and the created order. The translation indicates that ‘testament’ would be a better word than ‘instrument’ for T’s readers.